"GR" redirects here. For the rarity officially abbreviated as GR, see Gold Rare. Ghost Rare, known as Holographic Rare in the OCG, is a rarity introduced in the TCG version of Tactical Evolution. Ghost Rare cards initially had a very shiny silver lettering for the card name, much like a Secret Rare, with some colors removed from the card image. 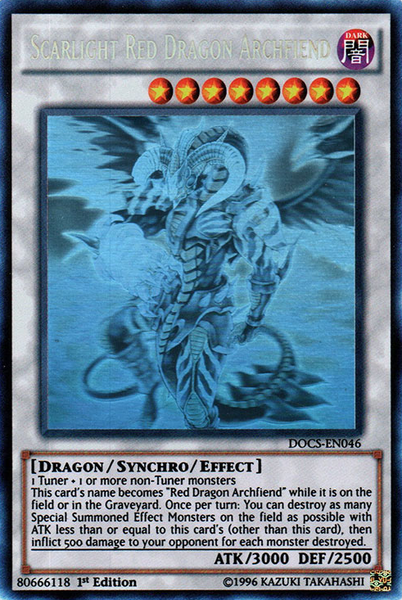 Newer cards now have a gold card name (similar to an Ultra Rare) with a 3D holographic image (starting with "Red Dragon Archfiend/Assault Mode" in Crimson Crisis). The body of the monster itself seems split, making the image look 3D. If a light is shone on the card image, the color changes. As a result, it can be hard to make out the monster on a card colored this way. At a certain angle the image's color is somewhat restored with the same colors as the normal card just in a dimmer version. The overall effect of these changes is a pale, "ghost-like" appearance to the card art, especially when scanned. Ghost/Gold Rare cards, a hybrid between Ghost Rare and Gold Rare, can also be found in the Gold Series: Haunted Mine packs. From Tactical Evolution to Lord of the Tachyon Galaxy the Cover Card of a pack was released as Ghost Rare, with the exception of "Rainbow Neos" in Phantom Darkness. 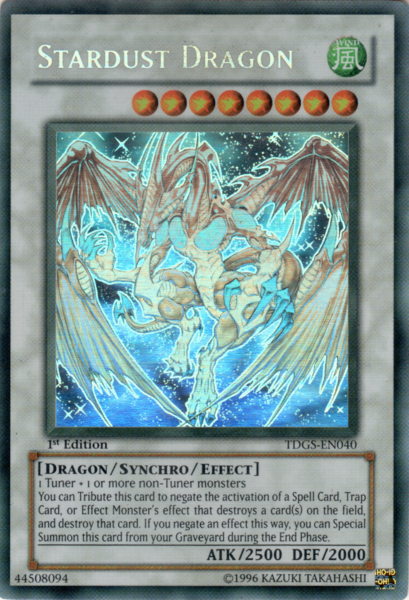 From Judgment of the Light onward, the Cover Cards are no longer automatically the Ghost Rare for the set—now the Ghost Rare can be any one of the Secret Rares featured in that set (the exception being "Dark Rebellion Xyz Dragon" in The New Challengers, and "Clear Wing Synchro Dragon" in "Crossed Souls" which were both a cover card and a Secret Rare). Starting with Breakers of Shadow, Ghost Rares are no longer going to be present in regular booster sets; it is unclear if Ghost Rare is going being included in other products in the future, but it has been stated that they may return at some point. 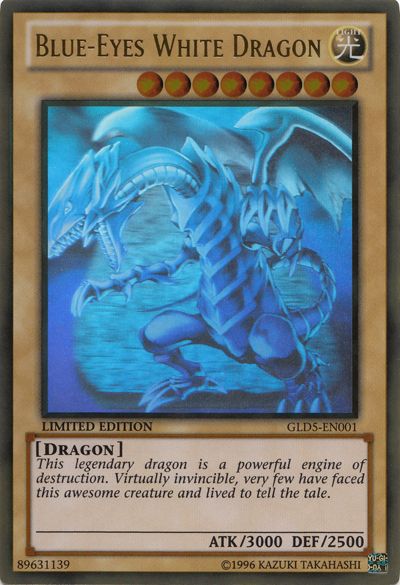 There are currently only 34 Ghost Rare TCG Cards: "Rainbow Dragon", "Elemental HERO Chaos Neos", "Rainbow Neos", "Honest", "Stardust Dragon", "Black Rose Dragon", "Red Dragon Archfiend/Assault Mode", "Power Tool Dragon", "Ancient Fairy Dragon", "Majestic Star Dragon", "Majestic Red Dragon", "Black-Winged Dragon", "Dragon Knight Draco-Equiste", "Shooting Star Dragon", "Odin, Father of the Aesir", "Junk Berserker", "Number 17: Leviathan Dragon", "Galaxy-Eyes Photon Dragon", "Number C39: Utopia Ray, "Neo Galaxy-Eyes Photon Dragon", "Heroic Champion - Excalibur" "Number C32: Shark Drake Veiss", "Number 92: Heart-eartH Dragon", "Number 107: Galaxy-Eyes Tachyon Dragon", "Star Eater", "Divine Dragon Knight Felgrand", "Mobius the Mega Monarch", "Bujinki Amaterasu", "Stellarknight Delteros", "Dark Rebellion Xyz Dragon", "Malacoda, Netherlord of the Burning Abyss", "Clear Wing Synchro Dragon", "Red-Eyes Flare Metal Dragon" and "Scarlight Red Dragon Archfiend". There are 6 Gold Ghost Rare cards from Gold Series: Haunted Mine: "Herald of Perfection", "Blue-Eyes White Dragon", "Gorz the Emissary of Darkness", "Naturia Barkion", "Solemn Judgment" and "Mystical Space Typhoon".